Furniture addons flooded the Internet, you saw a lot of similar additions that add different furniture to Minecraft PE. Mine-Furniture is one of the biggest add-ons that adds 24 household items. In addition to a wide choice, this furniture can perform some functions comparable to the real objects that we use every day. For example, a player can take a bath or listen to music, store food in the refrigerator or sit on a chair. Thanks to this, your house will acquire much more functions and will look more realistic. It is unlikely that a medieval house is suitable for these purposes, so download a modern one or build a small cottage. Mine-Furniture only replaces items, so you can not get the furniture without using commands or creative mode. Take a shulker egg (DLbox) and throw it into the place where you want to put the furniture. Then you will need different shulker colors to turn the DLbox into something. Use a long tap on the DLbox, after which the box is transformed into the desired object. All items are divided into categories suitable for certain rooms. Table - can store items, but you can not put objects on the table. Chair - you can sit on it. Refrigerator - food storage place. Coffee Table - item storage place. Red and blue stools - you can sit on them. Blender - a decorative item (in version 2, it can mix potions). Grill - used as a stove for cooking meat. Trash can - stores unnecessary items. Bathtub - there are two types of baths: filled with water and without water. You can fill the tub with water using soap and then bathe. A bucket can drain the water. Toilet - you can sit on it. Computer - decorative thing (in version 2, it can store jewelry). Statue - decorative item, but perhaps a place to store weapons in the future. Radio - plays melodies with the help of a gold ingot. Huge safe - can be used as a bunker. Electric fan - animated decorative element. Baby crib (different types of wood). Diapers for turning into a baby. Now all furniture is named. 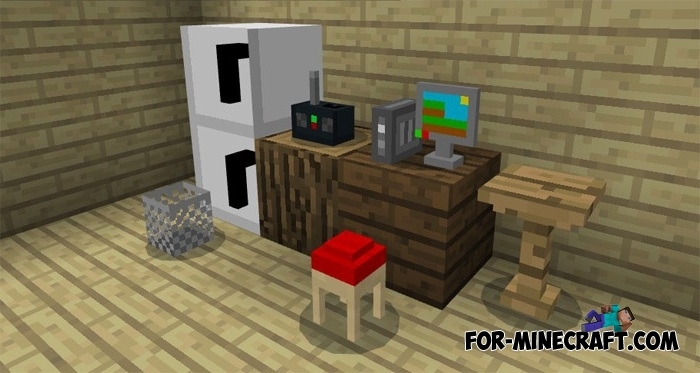 The Mine-Furniture addon is very similar to the Modern Furniture addon (download), although it contains more items. The addon will be updated, so wait for new furniture and report bugs here - MicoLets_MCs.